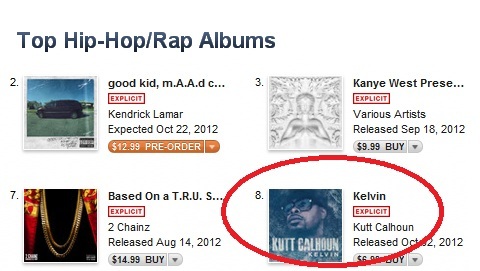 Less than a full day into its official release, Kutt Calhoun’s Kelvin EP is showing some impressive movement as it made its way into the Top 10 Hip Hop/Rap albums on iTunes, joining the likes of 2 Chainz, Kanye West, and Kendrick Lamar. The new EP, entirely produced by Seven, marks Kutt Calhoun’s first release since 2011’s Red-Headed Stepchild and features the singles “Bottle Service” and “Strange $”. Raising the bar once again, Kutt Calhoun aims for a third year as Strange Music MVP and from the love Kelvin is getting, there may not be much stopping him. CLICK HERE TO PURCHASE KELVIN FROM iTUNES! Have you picked up Kelvin from iTunes yet?